Today we got a chance to finally ride the new Bajaj Pulsar RS200. Bajaj had earlier opened sales of the motorcycle announcing a price of Rs 1.18 lakh ex-showroom Delhi. 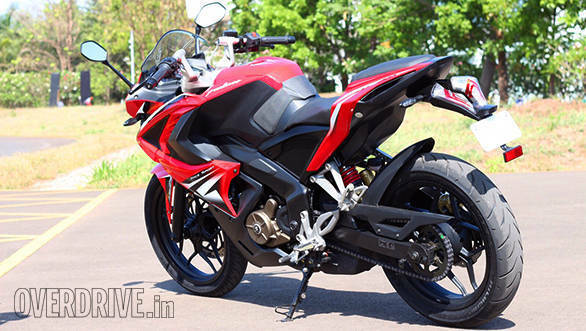 As you know the motorcycle is based on the Bajajbut is formatted to look like a supersport motorcycle. Here's what you need to know. The frame is the same pressed steel job as the Pulsar 200NS but the steering is one degree sharper (and hence the wheelbase comes down by 5mm) and it wears a bunch of metal stays needed to mount the fairing now. In the process of this and the plastics of the complex looking fairing itself, the weight has gone up by a substantial 12kg, 6kg of this comes from the mounts and plastics alone while 2.5kg comes from the ABS unit and bigger magneto for the twin projector lamps. The new bodywork et al also move the centre of gravity a smidgen forward which Bajaj says gives a more secure feel at the front. You don't feel it but the engine most certainly has to work harder to produce performance. The engine itself has a new head to accommodate the fuel injection system which uses 4mm bigger throttle bodies than the carbs on the NS. 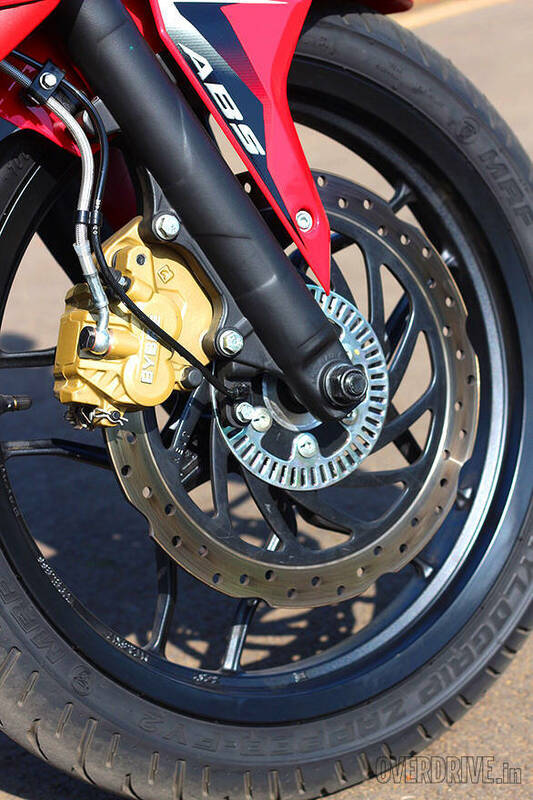 The FI system is identical to the 200 Duke but has software tuned specifically for the RS 200. The new tune gives the bike 1PS more and Bajaj are using the extra power to good effect by lowering the gearing (2 teeth added at the back) for greater mid-range performance and still managing to see a higher top speed. The engine itself has a new head to accommodate the fuel injection system which uses 4mm bigger throttle bodies than the carbs on the NS. 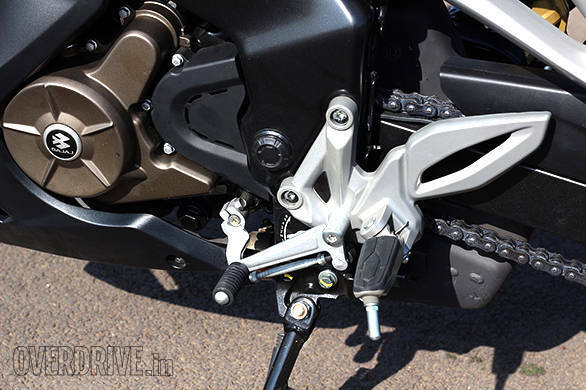 The FI system is identical to the 200 Duke but has software tuned specifically for the RS 200. The new tune gives the bike 1PS more and Bajaj are using the extra power to good effect by lowering the gearing (2 teeth added at the back) for greater mid-range performance and still managing to see a higher top speed.Bajaj further says that because of the fairing, a lot of work has been done on ensuring serviceability and many check and replacement intervals are now farther apart. I think the RS200 feels a little more linear in power delivery terms than the 200NS but that aside it isn't very different. The engine develops 1PS more and is able to use the gearing to push the bike to a higher top speed and I saw 151kmph on the clocks (assume 10-15 per cent speed error on this) before having to turn into the super fast last corner of Bajaj's test track at Chakan. Bajaj have altered the engine head to accommodate the Fi and bigger throttle bodies now. Speaking of fuel injection, the unit is the same one which is made by Bosch and is also in use in the KTM 200 Duke. However, for the RS200, it gets a new software and different state of tune. How is it in corners? It's very responsive and confident though bumps at really high speeds need you to have the confidence to stay on the throttle. Turn is quick enough - but not very quick - and the motorcycle feels sporty without really feeling too sharp for new riders. Bajaj has, in the past shown an ability to manage the ride and handling balance rather well and the RS200's capabilities are no surprise. What is a surprise is how enjoyable the RS200 feels to ride. The sticky MRF tyres on the bike deserve a special mention - they're super grippy and return excellent feedback though chances are they'll last a little but less than the Eurogrips on the other Pulsars. Yeah. It's a cost saving measure to be sure but the ABS version of the Pulsar RS200 only works on the front wheel. This isn't a problem because most of a motorcycle's braking does happen at the front wheel. That said, I do feel that Bajaj should have gone the whole hog and ABS'd the rear wheel as well. I guess better that some people are able to afford this safety device than not, right? 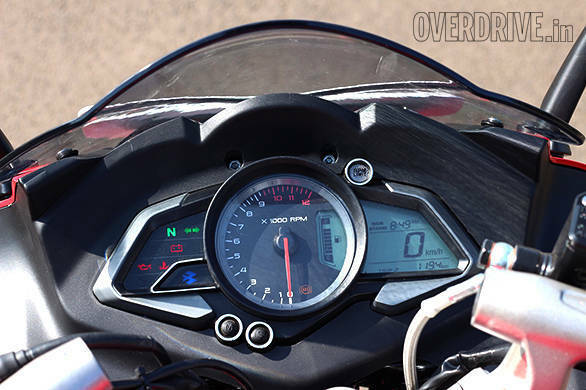 The Bajaj Pulsar RS200 packs no unpleasant surprises. It is based on a competent platform and Bajaj has carefully chosen not to break a working formula. I do have issues with how busy the motorcycle's styling is but in the same breath, I'll admit that in the flesh it doesn't look quite so out there either. Finish levels look acceptable and overall, the motorcycle is pretty easy to decide to purchase. 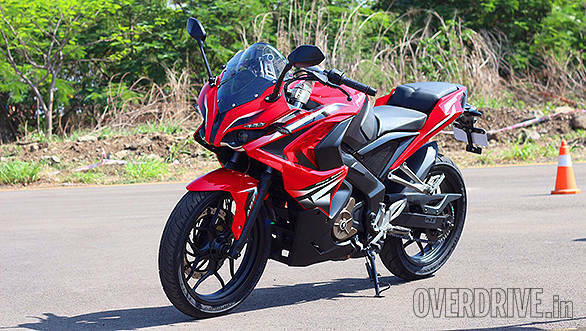 The Pulsar RS200 without ABS is Rs 23,000-odd more expensive than the NS, which is a reasonable jump considering the plastics and the fuel injection system. ABS adds another Rs 12,000 to the bag and if I were buying an RS (actually any motorcycle at all), I would certainly pay the difference and get the ABS-equipped motorcycle. What I'd buy it for though, is the handling package and its ability to corner.